Spain. 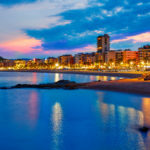 Country of bar hopping until the early hours of the morning, golden sands that stretch endlessly along the coasts and… some of the most delicious food you can find in the world. 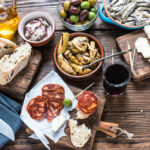 From tapas to pisto and all things edible in Spain, this country is home to dishes that are sure to tempt your taste buds. 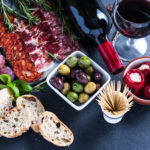 If you aren’t sure where to start your culinary journey, check out our list of the top ten foods you absolutely must try when visiting Spain! 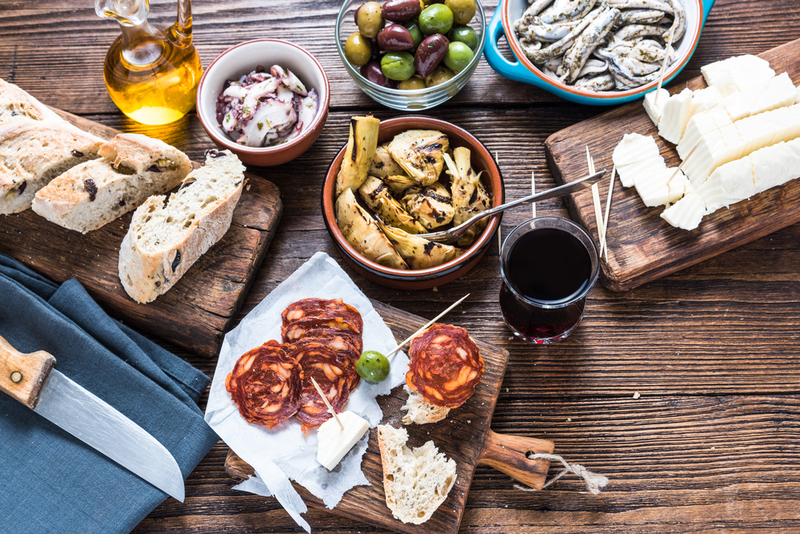 Contrary to popular belief, tapas aren’t limited to being a specific type of food, so get excited! 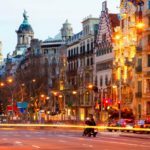 Instead, tapas are little plates of smaller-portioned meals that the Spanish locals enjoy eating at practically any time of the day, but especially at night. 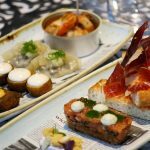 They’ve become deeply engrained into their culture, so if you want to eat like a local then be sure to tapear, or in English, eat tapas! Tortilla espanola is a traditional Spanish omeletter. While you’ll find different variations in texture as your travel throughout the country, there are a few consistencies. The omelette will always be made with a combination of eggs, onion and potatoes flavored simply with salt and pepper. While they’re excellent any time of the day, try to enjoy one for breakfast before you take part in siesta for a true Spain experience! Paella is a must-try Spanish staple no matter where your travels take you in the country. Depending on where you are, you’ll be able to find three different types pretty easily: Paella Mixta, Paella Valenciana and Seafood Paella. 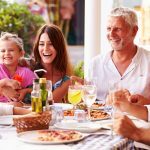 They are essentially the same thing, consisting of rice, some fort of meat or seafood, vegetables and some spices or seasoning, but the distinct differences will definitely have you picking out a favorite before you head home! One of the best things about Spanish food is that it can be cooked in many different ways. That means you’ll be able to try and replicate your favorites when you get home! One such dish is gazpacho. Made to taste, gazpacho can be warmed up, cooled down, or served as a soup or salad. Generally speaking, however, in order for it to be considered the Spanish dish it needs to be made with vegetables like cucumber, onion and tomatoes, and flavorings like salt, olive oil, wine vinegar and garlic. Like a crème brûlée, crema catalana is a delicious dessert that you’ll be eager to skip dinner for. But, unlike its culinary cousin, crema catalana is a combination of lemon rind and cinnamon served in a cold custard. This means it’s going to be a lighter, more refreshing dish on your taste buds than the thicker vanilla custard-style crème brûlée hat you’d have in France. If you aren’t opposed to sheep milk, be sure to try some queso manchego. Although it’s prepared from a specific sheep breed, the Manchega, from which it got its name, this tasty cheese can be found in food establishments all throughout the country. Unlike a lot of cheeses you can find throughout the world, this one has a very distinct and intense flavor that will at first shock and pleasantly surprise you. Once you’ve taken a few bites, you’ll be wondering where you can pick some up to bring home! Not to be confused with other variations of the same name, allioli is a Catalan-style sauce that can be paired with savory dishes. Ask for some when you order baked potatoes for a truly delectab;e meal that won’t disappoint! Even better for those thinking they really don’t like mayonnaise, it isn’t made with any eggs at all! Instead, it’s a brilliant combination of olive oil, garlic and salt. It may sound simple, but don’t let that fool you into thinking it’s anything but delicious. When you go into a bar in Spain you’ll likely be able to spot huge chunks of jamon iberico hanging from the rafters. 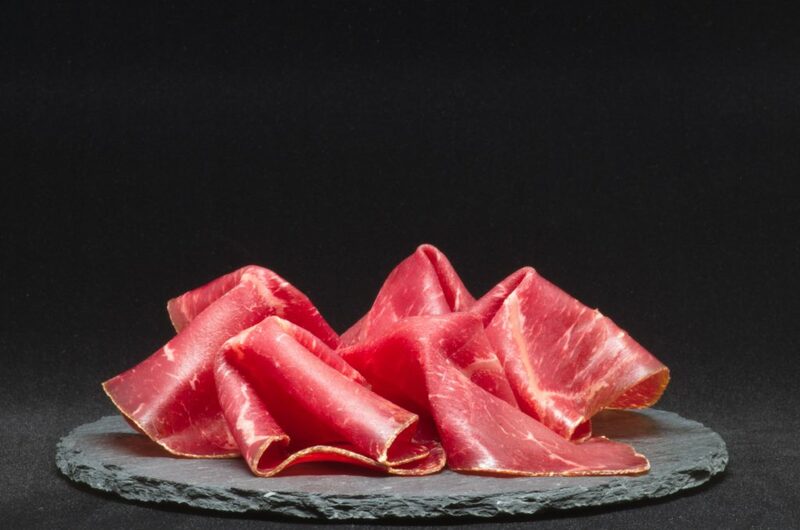 Try to find a more old-fashioned establishment if you’d like an authentic Spain experience, because watching the bartended slice a piece of this dry-cured ham is a truly remarkable Spain experience you definitely need to have! Each region of Spain is going to have its unique, but equally delicious, take on patatas bravas. These little chunks of fried potato are served as tapas and look a lot simpler than they taste, which means your taste buds will be in for a treat no matter what sauce is on them! Pisto is similar to a more well-known dish, ratatouille. It is cooked slowly with courgettes, peppers, tomatoes, onions and garlic in some olive oil. It’s served warm as a side dish or a standalone appetizer, but either way you’ll be wishing it were a full meal!